Drooping Sheoak, Allocasuarian verticillata, woodland. Once common around Geelong and Melbourne before the 1850's when it was harvested for its hot burning firewood. It’s a warm spring day and I’ve strayed off the beaten track to check out a wildflower growing in the shade of a Drooping Sheoak. The litter of golden needles strewn about under the tree makes it easy to spot the beautiful yellow flowering Cut-leaf Goodenia growing at its base. A Willie Wagtail breaks the perfect silence with a crack of its beak and I’m startled before I realise there's nothing to fear. This brave little bird has seen me as a threat and an intruder near its nest just a meter or so above my head. I take the hint and move on, not wanting to distress it any further. Sheoaks have been around a long time and their history can be traced back beyond 70 million years to before insects evolved on planet earth. They still use the pollinating system that sustained them in ancient times, allowing wind to spread the pollen from the male to the females trees. This ability to survive can be seen today as a toughness that makes them very important for revegetation work in dry exposed areas and is demonstrated by their dogged endurance on roadsides where nothing else is able to persist. The Drooping Sheoak is a very distinctive and graceful small tree though many people are indifferent to their charms and have to be convinced to include them in plantations. The timeless whisper of the breeze through their pendulous vegetation, their rough barked buttressed trunks and their grey pine-like foliage called branchlets make then distinctly Australian. You can distinguish them from other sheoaks by the large bantam egg sized cones that grow on the female trees and the long catkins that turn the male trees yellow to bronze in the winter months. However, it seems to the average person Drooping Sheoaks are a bit like the Collingwood football club, you either love ’em or you hate ‘em.. 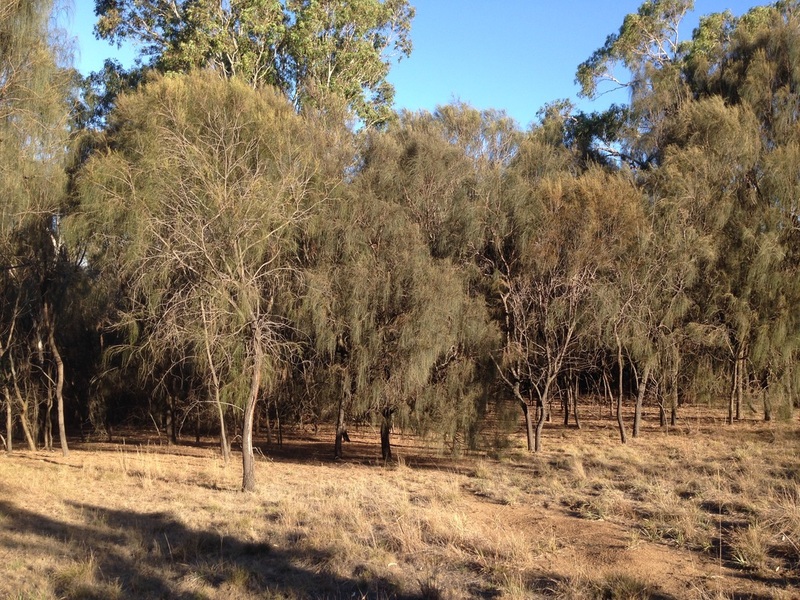 In a Grassy Woodland, 5 - 10 m trees like the Drooping Sheoak provide the important understorey layer that smaller birds and mammals need, to screen them from aerial predators like the Brown Falcon and that farmers need to provide medium level shelter for stock from the cold winter winds. They are also a useful small paddock tree as they provide dappled shade and welcome browsing for stock in the dry months when pasture grasses are in short supply. 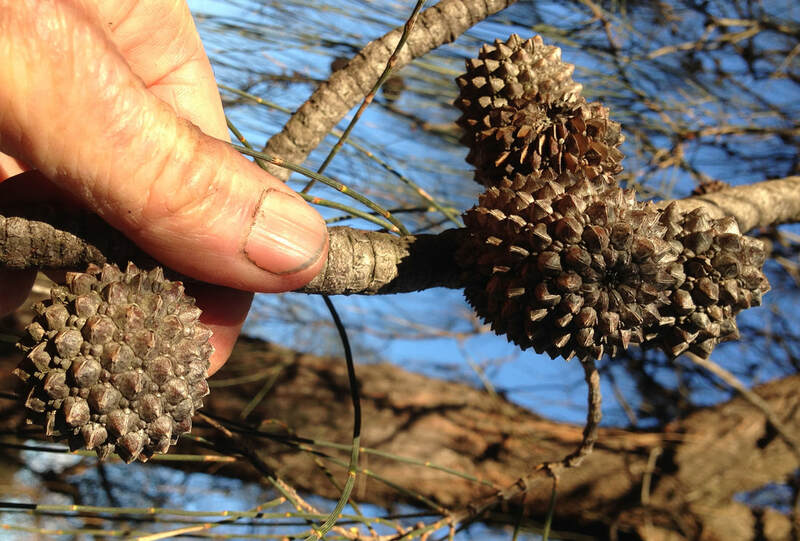 Drooping Sheoak cones are the size of a bamtom's egg. 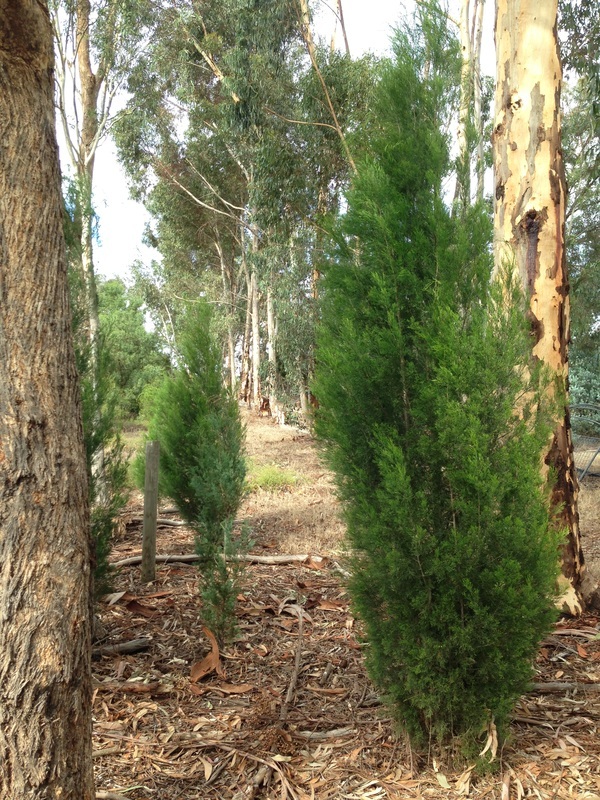 The smaller Black Sheoak, is a very versatile tree and can be used for landscaping, windbreaks and revegetation works where it’s not too exposed and dry. Less common than the Drooping Sheoak, its upright ‘radiata pine like’ habit makes it very recognisable on roadsides. Though don’t mistake it for its distant cousin from the northern States, the suckering Swamp Sheoak (Casuarina glauca) that has been very successful on the heavy soils of the basalt plains. 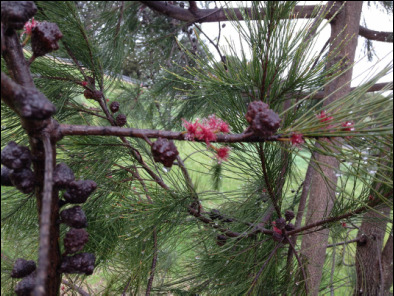 The female of the Black Sheoak has small cones about the size of an olive and the males catkins turn the trees a beautiful burgundy to bronze. It seems to be a favourite with the handsome White-eared Honeyeater which feed on the insects found around Black Sheoak and Manna Gum communities growing in the Inverleigh Nature Conservation Reserve. Black Sheoak cones and red flowers - its a girl! 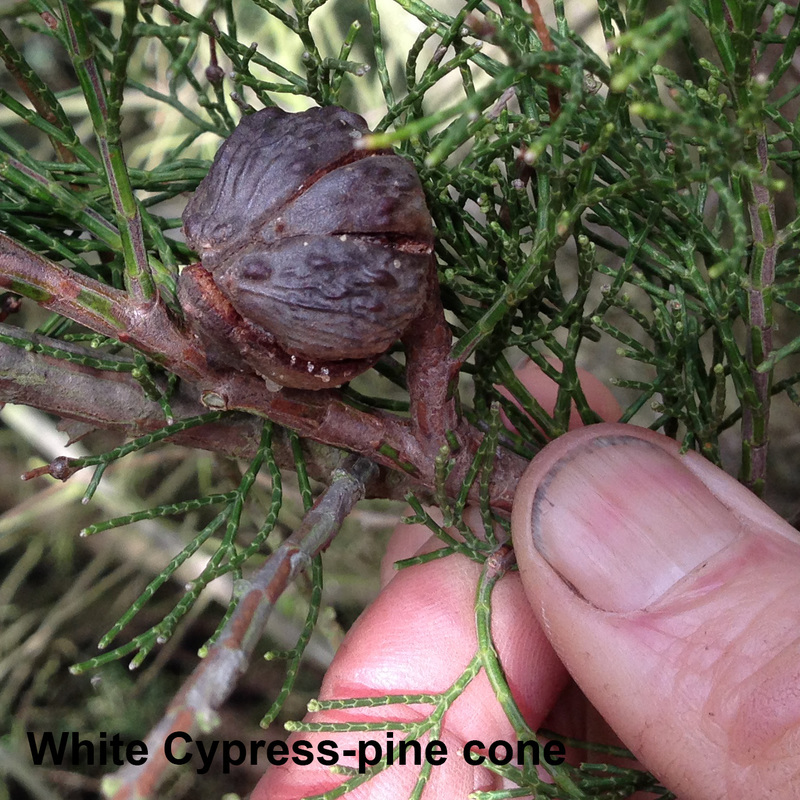 ​White Cypress-pine are common in the north of the State but they are very rare locally with only one mature tree surviving at Dog Rocks Sanctuary and some others on the Leigh River near Shelford. Their slender, elegant upright habit and green-grey foliage make them a better visual fit in a Tuscan landscape than the Barrabool Hills, but remarkably they were there. There's is another amazing story of survival and endurance as a relic of the last ice-age when southern Victoria had a much drier climate. 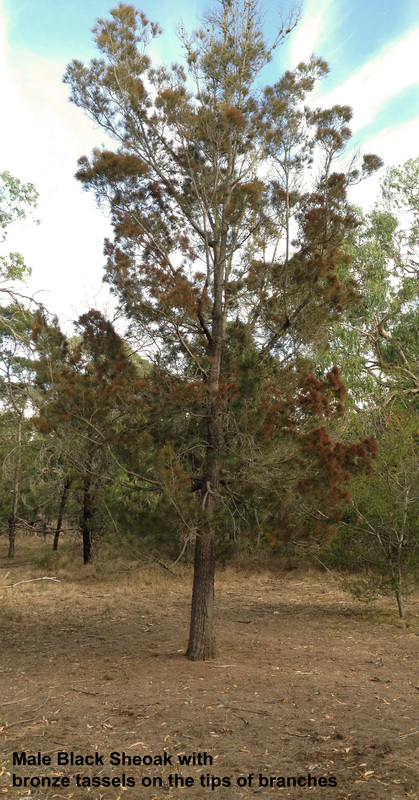 Fortunately the White Cypress Pine is making a comeback at Dog Rocks Sanctuary and at a property near Ceres where it is being planted in an arboretum to protect it from local extinction. This is without a doubt one of the toughest trees you’ll ever plant and it will thrive in the driest most exposed positions. It’s a favourite with Galahs and Cockatoos who savour the small cones as well as small birds that feel safe in its dense needle-like but soft foliage. Young trees growing under 30 year old Sugar Gums - that's tough! Well done. I hope you enjoyed reading about these amazing trees without leaves. Make a coffee and come back for a quick read about another amazing native plant without leaves. This one has edible fruit and is an important plant for Victoria's traditional owners.